Raise hands who buy or rent Hollywood movies and television shows on iTunes… As ubiquitous a destination for digital music purchases, iTunes has not been able to hit the ground running in online video. 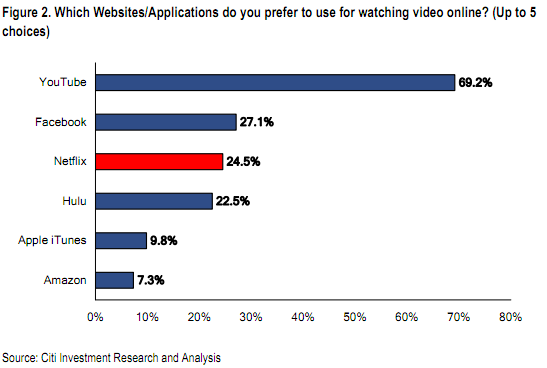 A survey of web users by Citigroup’s Mark Mahaney re-iterates that Netflix and Hulu remain the leaders of premium video entertainment, even though YouTube is everyone’s favorite source of free web clips (69.2 percent). Surprisingly, Facebook came in second (27.1 percent) and ahead of Netflix (24.5 percent) and Hulu (22 percent). While Facebook does host user-uploaded videos, it mostly aggregates YouTube clips users publish on their wall. Things look different when only paid downloads are analyzed. According to the last year’s survey by IHS iSuppli, iTunes’ share of the US online movies market was a whopping 64.5 percent versus Microsoft and Sony which placed second and third with 17.9 percent and 7.2 percent share, respectively. But iTunes also has its share of problems. For starters, it sells copy-protected movies using Apple’s FairPlay digital-rights management scheme, meaning iTunes movies are locked to iTunes-compatible PCs and Macs plus iOS devices. It’s a content owners-imposed requirement rather than Apple’s choice and unlikely to go away anytime soon if Hollywood studios have any say in this. Another thing: iTunes still does not serve 1080p content and its selection of premium, latest flicks – although richer than that of most rivals – nevertheless leaves a lot to be desired.